Bamboozled September 3, 2018: Man terminates car lease under special promotion. Then a collection agency came knocking. It’s common for car dealerships and manufacturers to offer special promotions to entice customers to trade in their current car for a sparkling new model. It could be a promise of discounted prices, an inflated trade-in value, rebates or zero-percent financing. The promotion that drew Harry Witt to local Hyundai dealerships was a common one. It was an offer to eliminate early termination fees on his current Hyundai lease if he would lease a new vehicle. But more than two-and-a-half years after he took the deal, a collection agency came after him for what it said was a nearly $1,000 early termination fee, documents show. Even worse, the alleged lack of payment ended up on Witt’s credit report. It started in January 2016 when Witt received a letter from his dealer, Maxon Hyundai in Union. It said he could return his leased 2013 Elantra without penalty if he leased a new car. But the dealership didn’t have the vehicle Witt wanted – a 2016 Sonata – so he shopped around and found the car at the now defunct Brad Benson Hyundai in Monmouth Junction. That dealer was honoring the same promotion and would pay off the old lease and any fees, documents show. The deal was made on Jan. 29, 2016, and Witt drove away happy. Six months later, in July 2016, Witt received a letter from Hyundai Motor Finance saying he owed $955.20 on the old lease. That had to be a mistake, Witt said he thought. 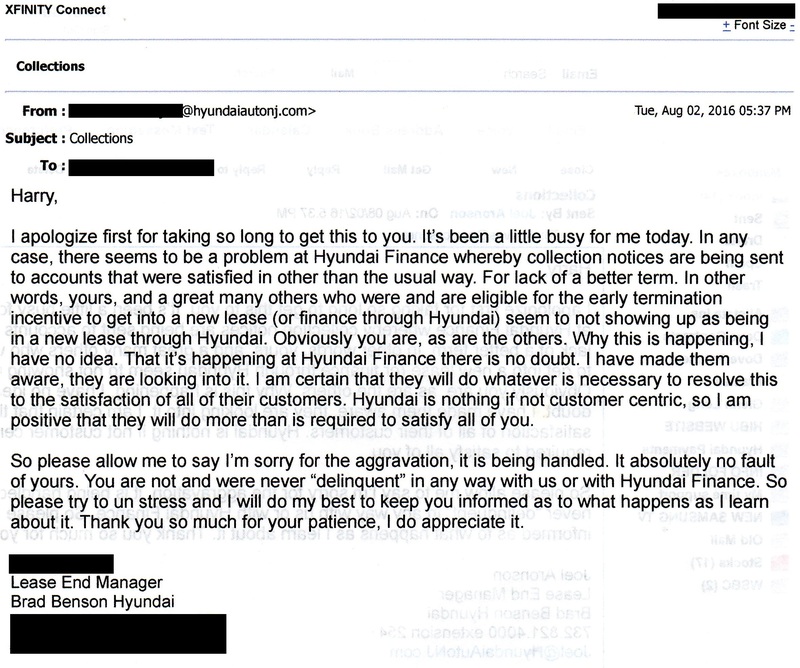 Harold Witt received this email from the Brad Benson Hyundai lease manager about the lease promotion. Witt contacted Brad Benson Hyundai, and the lease manager responded in an email to Witt on Aug. 2, 2016. “You are not and never were ‘delinquent’ in any way with us or with Hyundai Finance,” he wrote. The manager said he contacted Hyundai Finance to get the issue resolved. Witt spoke to the dealership a few weeks later, he said, and he was assured everything was taken care of. Fast forward to July 19, 2018, when Witt received a letter from SRA Associates, a collection agency. It said Witt had until Aug. 14 to pay the unpaid early termination fee. Witt contacted the collection agency to dispute the matter, but the agency just asked for the payment, he said. He also tried to contact the dealer, but he learned Brad Benson sold the dealership to DCN Hyundai. The folks at DCN weren’t willing to help, he said, and a letter Witt wrote to the general manager went unanswered. Witt asked Bamboozled for help. Bamboozled reached out to Hyundai’s corporate offices to ask it to review the case, and it said it would investigate. We also reached out to DCN Hyundai’s general manager. The general manager returned our first message, but we missed the call. He didn’t respond to subsequent messages. In the end, that didn’t matter because Hyundai’s headquarters came through. In three days, the matter was solved. Witt received a call from Hyundai Motor America with an apology, saying he’d receive a check in the amount owed so Witt could pay off the collection company. He received an email confirmation the next day. But there was one more issue. Bamboozled recommended Witt check his credit reports to see if the collection action was reported. It could take a month to resolve the dispute on the credit bureau’s end, so we asked Hyundai to step in to remove the bad marks on Witt’s reports. We also explained to Hyundai that if Witt was to pay off the collection company, it would appear on his credit report that Witt agreed with the debt, and that would result in another bad mark. Witt soon heard from Hyundai Finance, which said it had zeroed out his account. It promised to send updated information to all three credit bureaus saying the account is now closed with a zero balance and that all payments were on time. So for now, Witt is planning to keep the money. Witt said he hopes his story will help others fight a wrongful debt. So, dear readers, remember that when you do business with a car dealership, you can be working with several entities: the dealer, the manufacturer, and the finance company. Even if they all use a similar name, they are all separate businesses. If you have a problem with a finance company, like Witt did, the dealer may not have the power or wherewithal to help you. But it should have some influence, so be sure to ask for help and be persistent both on the dealer and the corporate level. Also make it a point to hold onto all your records, even years later, to support your case should something unexpected come up. If Witt didn’t have his evidence, we’re not sure what would have happened.